Multi-Plug Outlet adds multiple outlets quickly and easily. Multi-Plug Outlet adds multiple outlets quickly and easily. The low profile, wall hugging, side socket plug in design allows furniture to fit closer to the wall. No more kinked or broken cords. 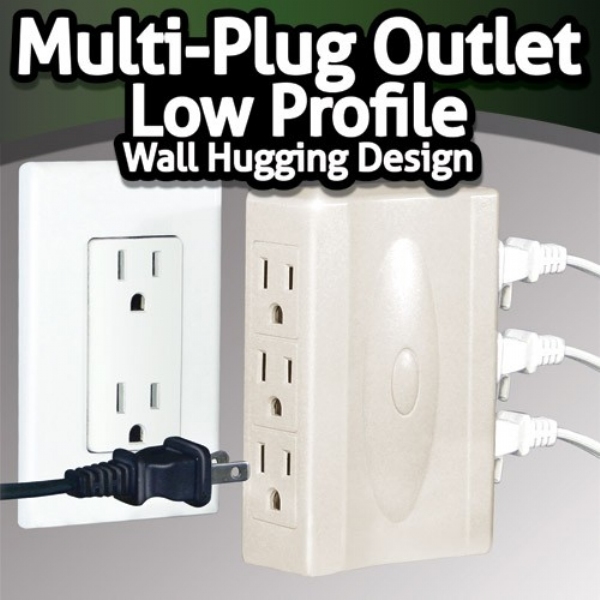 The Multi-Plug outlet as seen on TV turns any standard 2 plug wall outlet into a hard working 6-oulet center. Perfect for the family room, bedroom, office and more. Approx. measurement 4.7"x3.2"x1.3". Set of 2. Works Great! Gave my Desk lots of space so theres not to many plugs all over. Just take out of the box and plug into the wall and that&apos;s all. This product is fabulous and solved some problems for us. It&apos;s difficult when outlets are located behind furniture. The plugs  cords stick out from the outlet and make furniture placement difficult. With this product we can have multi-plug outlets and still place furniture close to the walls. We bought 4 to begin with but plan to buy several more.